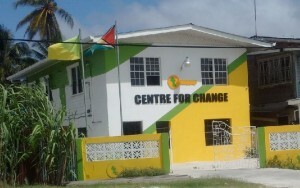 The Alliance For Change (AFC), one of the parties in the governing coalition, Friday said it would guard against electoral practices, and that it was not involved in selecting Retired Justice James Patterson as the next Chairman of the Guyana Elections Commission (GECOM). “The AFC holds GECOM to the highest standards of electoral integrity and will stridently challenge any threats to the preservation of our democracy,” the party said in a statement following an executive meeting held at its headquarters on Railway Road, Kitty. That vow comes against the background of President Granger’s unilateral hand-picking of Justice Patterson for the post of GECOM Chairman, after rejecting a total of 18 names contained in three lists that Opposition Leader, Bharrat Jagdeo had submitted to him over the past 10 months. The party, for the second time in less than one month signaled that it would not agree to a shifting back of Guyana’s electoral schedule. “Now that GECOM is fully constituted the party expects that it will commence its work immediately in preparation for Local Government Elections in 2018 and Regional and General Elections in 2020,” the party said. There are fears in some quarters that Granger’s direct pick of James now gives him four out of seven votes around the elections commission table if it comes down to major decision-making. The opposition People’s Progressive Party also has three commissioners. The AFC is in government with President David Granger’s People’s National Congress Reform-dominated A Partnership for National Unity. The AFC’s pledge to guard against irregularities for which People’s National Congress Reform- the party which Granger now leads- had become notorious especially in the 1970s and 1980s until 1992 when the first free and fair poll in almost 30 years was held. The PPP returned to office in 1992 for the first time since 1964, but was defeated at the May 2015 elections by one seat in the 65-seat House. That party, which hold several key ministerial portfolios -Public Security, Public Infrastructure, constitutional reform and governance, Agriculture, Public Telecommunications, Business and Tourism-made it clear that it had no input in the appointment of Justice Patterson. “The AFC played no part in the selection process,” the party said. While the AFC welcomed President Granger’s move to avert a constitutional crisis by appointing a GECOM Chairman, it would push for constitutional guarantees for wider consultations. “The AFC intends to use the constitutional reform process to ensure that there is wider participation of stakeholders in the selection of GECOM commissioners,” the party said.